I’ve been to Candaba wetlands dozens of times, and I usually stay in the area from dawn until well after sunset. But I’ve gotten near this night hunter in daylight only twice – both cases under the same lighting circumstances and similar time of day. The late afternoon sun was covered by heavy clouds, making it appear that nightfall was coming in ealier than it should. 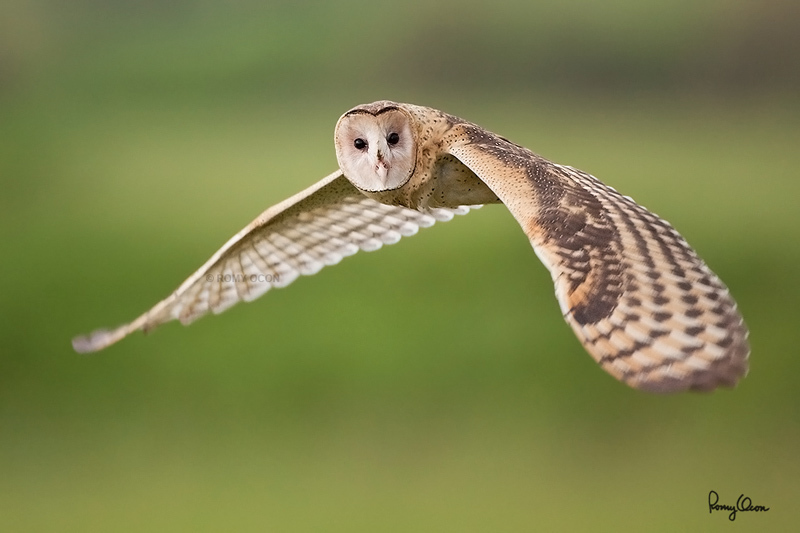 Perhaps seeing that it was already dusk, the owl came out to hunt, flying low and silently over the grassy areas of the wetlands. Just before the sun disappeared in the western horizon, the clouds thinned somewhat, allowing some light to illuminate the place. This made it possible to get a fast enough shutter speed to freeze the bird in the air. This raptor acted like it was curious – it circled around and looked straight at me while I was trying to acquire focus in the low light. The out of focus grasses in the distance provided a pleasing creamy background to the nocturnal bird of prey. Many of the shots were misfocused, probably because the dim light was straining the AF system or maybe because I was trembling with excitement as I was tracking the subject. Whatever the reason why I missed many frames, I wouldn’t know for sure. But I got at least one photo sharp, and this made me do the “dance of joy” once I confirmed the keeper in the 1D MII’s LCD. Habitat – Grasslands and canefields. Shooting Info – Candaba wetlands, Pampanga, Philippines, May 27, 2008, Canon 1D MII + EF 500 f4 IS, f/4, ISO 800, 1/500 sec, 475B/3421 support, near full frame, manual exposure in available light, pushed +2/3 stop in RAW conversion. A short video of the Australasian Grass-Owl. Thank you & Keep on Posting!